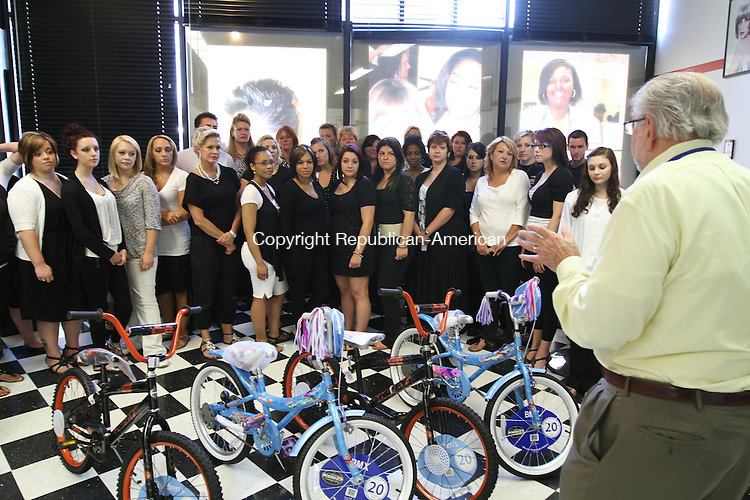 TORRINGTON, CT - 26 June, 2011 - 072611MO03 - Students and staff of Brio Academy of Cosmetology on Tuesday presented four children's bicycles purchased with proceeds from a June "dress down day" fundraiser to Torrington's FISH homeless shelter. "You can't believe how important this is to the kids that we serve," said Executive Director Kevin Purcell, at right, facing students. FISH will distribute the bicycles in conjunction with the annual Christmas toy drive. Jim Moore Republican-American.